Iron Man is a Marvel hero, known for wearing a high tech, armored suit to fight evil. He is a founding member of the Avengers super group. Iron Man / Tony Stark has been played by Robert Downey Jr. in the Movies: Iron Man, Iron Man II, Iron Man III and Avengers. He is set to appear in the upcoming movie Avengers 2: Age of Ultron. The Iron Man I movie is important to Marvel because it was the first major hit of the company producing its own films. Many of Movie Studio's doubted Marvel's ability to build a film universe because the film rights of Marvel's traditional heavy weight characters of the Fantastic Four, X-Men and Spider-Man. Iron Man had often struggled to maintain a continious line of comics in the same way X-Men and Spider-Man. The success of the film proved that Marvel could make hit films off its lesser known characters. The idea of the character is said to come from Stan Lee. He wanted to create a character based off what every one hated at the time and make them love him. Tony Stark is billionaire, industrialist, weapon maker and thus supporter of wars. At the time of his creation in the 1960s none of these things were popular. None the less, with his brash brilliance Tony Stark won over legions of fans. More detail on the history and capabilities of the Iron Man Armors from both the comics and the films. Want to know more about the Hulkbuster? The Red Snapper? This is the place. Here are some of the most popular Iron Man products found and sold on Amazon by Toylab. As an affiliate of Amazon we try to find the coolest items there to showcase them for fans. Tony Stark a brilliant, billionaire, weapons manufacture is kidnapped. The group that kidnaps Stark demands that he build them a weapon of mass destruction. During his capture Stark is grievously wounded in his chest, and he is barely holding on to life. Stark manages to outsmart his captors by building and armored suit that acts to both keep him alive and allows him to escape. Back in the United States, Stark decides to improve the armor he made. He adds a variety of capabilities to it, including propulsion, weapons, and sensors. Using his advanced suit and his brilliant mechanical mind Stark goes around the world protecting the innocent as Iron Man. Due to the wound sustained during his kidnapping there is a piece of shrapnel being held away from Stark's heart by a magnetic plate. If he removes the magnetic plate the shrapnel will move toward his heart and kill him. Stark must routinely recharge the chest plate to keep his heart working normally. Stark tells the world that Iron Man is his body guard and uses him as a corporate mascot. As he was created during the Cold War many of Iron Man early feats are against Communism. He battles the soviet spy the Black Widow. He then goes on to battle communist versions of Iron Man like the Crimson Dynamo and Titanium Man. Iron Man is generally fighting the forefront of contemporary concerns, whether they be corporate responsibility, espionage or recently terrorism. One of Iron Man's most enduring villains is with the villain the Mandarin. The Mandarin is an Asian villain who uses 10 magical rings to battle Iron Man. The head to head battles between the two men have long been popular in part because it puts science and technology up against magic. Iron Man is one of the founding members of the super group the Avengers. He has had many adventures as an Avengers and has even served time as the teams leader. Pepper Potts - Secretary, later Executive of his company and love interest. James "Rhodey" Rhodes - former Marine fighter pilot who becomes Tony Stark's personal pilot. Eventually, he receives an Iron Man suit of his own and defends the world under the name War Machine. 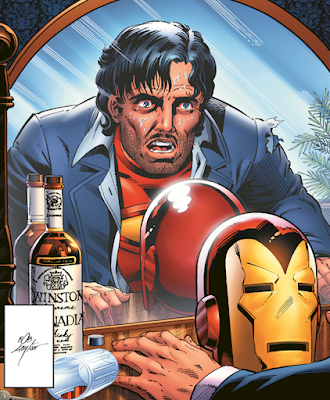 Tony Stark has been shown to be an alcoholic. In the story "Demon in a Bottle" various trials push Stark over the edge. He loses his company to a corporate rival Obidiah Stane. Stark becomes a drunk, homeless wreck. His friend Rhodey Rhodes takes over the Iron Man role. However, the suit is not calibrated to Rhodey mind and it starts to make him go crazy. Stark shakes off the bottle, dons his original suit and takes back his company. Iron Man has been played by Robert Downey Jr. Robert Downey Jr's version of Iron Man is one of the most popular and iconic characters in the MCU. Shows the origin of Tony Stark. Nick Fury makes first appearance hinting at potential Avengers connection. Tony Stark becomes Iron Man and defeats Obidiah Stane and his Iron Monger suit to take control of his company. Tony Stark revels in his celebrity as a modern hero and billionaire. He is confronted by a new threat in Whiplash a man that is able to understand and manipulate Stark's weapons technology. Forcing Stark to confront the dangers created by his inventions. Stark's friend Rhodey Rhodes takes one of Stark's suits and becomes War Machine on behalf of the US Government. Stark joins the Avengers team that stops Loki and the alien invasion of Earth. Tony struggles with his post traumatic stress from dealing with galactic threats he faced in the alien invasion. He is faced by a new threat in a terrorist who calls himself the Mandarin and an Extremis serum that gives super powers to a villainous group called AIM. Stark is rumored to create Ultron who is an advanced AI who goes crazy and tries to conquer the world. Iron Man will battle his longtime friend Captain America dividing the heroes onto both sides. Iron Man acts a mentor to Spider-Man and provides him with a specialized Spider Suit. However, Spider-Man chaffs at the rules and restriction imposed on him by Iron Man and decides to go out and be a hero on his own terms before running afoul of technoligcally enhanced super villain the Vulture.